*SCOPE NOT INCLUDED. Add Scope below in RED. The Ithaca Deerslayer III is designed for extreme accuracy at long ranges. Both carved out of solid pieces of steel, the barrel and receiver are CNC machined to aerospace tolerances by American craftsmen using American steel. This attention to manufacturing precision yields a gun that is built like no other. Built upon the classic Model 37 action, the Deerslayer III uses a fluted heavy-walled rifled barrel to produce its impressive results. It’s fully rifled too, so many brands of slugs perform well through it. 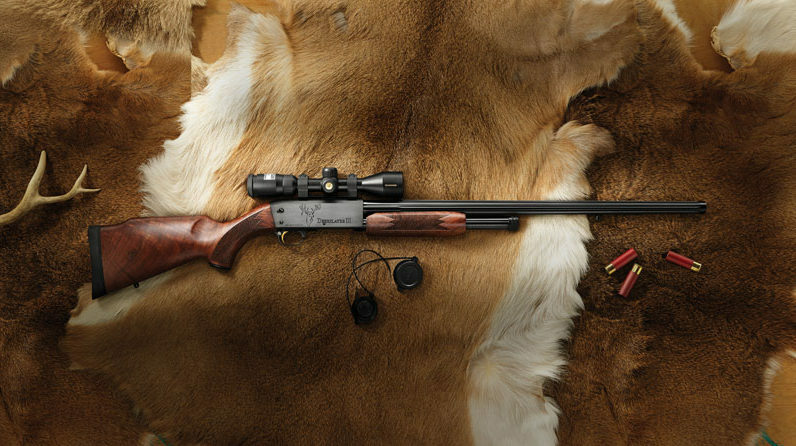 The Deerslayer III is capable of shooting four inch groups at 200 yards, and is as close to a big bore rifle that shoots saboted slugs as you can get! The gun is available in 12 gauge and 20 gauge.